A strong all-rounder that can work wonders with your top and low ends. Very little at this price. If you're not familiar with One Control, it's a Japanese company that makes a range of pedal ancillary items, including switching units and power supplies. 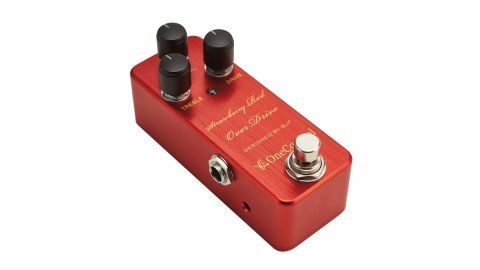 "The Strawberry Red Overdrive delivers the sort of overdriven tones you'd get from a cooking valve amp, predominantly with a US boutique flavour." Now distributed by Zoom UK, One Control products are destined to have a higher profile in this country, and perhaps deservedly so if they can tempt the likes of Bjorn Juhl (BJF) to design a range of pedals for them. The Strawberry Red Overdrive delivers the sort of overdriven tones you'd get from a cooking valve amp, predominantly with a US boutique flavour. Tweaks come courtesy of a treble knob that can deliver cut or boost in the crucial top-end frequencies to really complement your amp, while a bass trim pot tightens up any flabby low-end. It can also work as a clean booster, with a useful 6dB on tap. Besides that, it cleans up nicely with your guitar's volume control, too, making it a versatile tone machine.